There hardly is a card provoking so many 'oops' in a reading - never forget that the Death is meant as an archetype, a symbol. 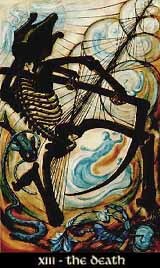 The Death represents the neverending circle of death and rebirth as the precondition for new life and creation, for life is permanently changing, hello and good-bye, leaving and arriving. The Death will show that something has ended and something will begin, and doesn't care if the end is painful and the new beginning welcomed or vice versa. The card implies the need to let something go, and requires the understanding of the circles of life. The negative aspect of the card could plainly mean that we want to keep what we have to give up, that no change is welcomed. In most cases it is just a refusal to understand and accept. It can mean we are scared of loss and also afraid to restart.